It's time for another Silhouette promo and this one is awesome. It's for the machine and vinyl - which is what I think everyone uses the most. There's also a simple entry giveaway at the end of this post. So, as I'm nesting for the baby I'm trying my best to make things in the house low-maintenance. I'm trying to teach the boys how to do more things on their own. Recently I decided it was time to tackle Baden's closet. It has these weird, deep shelves that I've never been able to utilize well which meant I had most of the things he needed to high for him to reach. So I purchased some inexpensive bins for his clothes. (He doesn't have a dresser.) Then I used some vinyl to make labels, so it's easy for him to know where things are. The decals were made by googling "long sleeve shirt silhouette" for example and then importing the image and tracing it. Not only can he find things now, but he can put away all his own laundry. Victory. Since he's only 3 he's not really into folding yet, but I really don't mind. I figure the world won't end if his pants are in a bin unfolded. 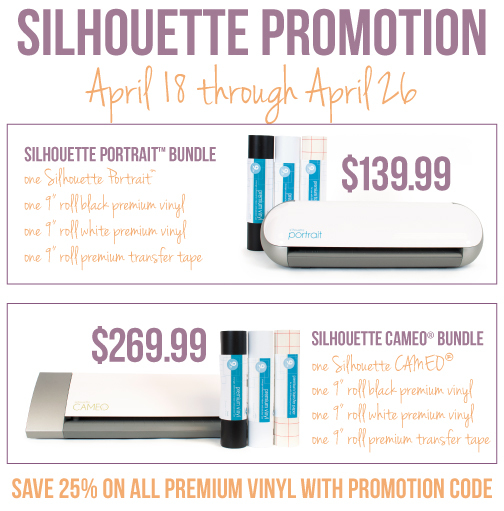 And if you're interested in purchasing the Silhouette, here's the current deal. There's one for the Portrait (the baby sister), the Silhouette (the big dog), and just purchasing vinyl as well. The vinyl price has been lowered and it's 25% off that, so it's a pretty good deal. To get the deal you have to go HERE and you can use the code "ROAR." Now, for the GIVEAWAY! This one is open to US residents. You may enter today through the 20th. Winner will be announced on the 21st. Just leave ONE comment on this post. If you accidentally leave more than one please go back and erase all but one. I would be the happiest girl in all the land if I were to win. I have a giant list of ways I'd like to use the Silhouette. Just found your blog from something off Pinterest. Love the clothes bin idea for promoting independence with chores. I don't have a Silhouette (yet! ), but I am definitely going to use some paper and tape to do this with bins for my son to do his own laundry. Love this simple idea which allows your child to be independent! I would love to win!! Love your blog, thanks for a chance at this great giveaway! Thanks for the chance to win a Silhouette! I always like the content in your blog. Crossing my fingers!!! Thanks for a great giveaway! Thanks for the chance to win! I've been drooling over the projects I've seen using a silhouette but haven't got one... Yet! Would love to win. Lots of organizing/labeling to do at my house! I love that you have just bins for Baden! I bet he feels so grown up doing it all by himself! I get so many great ideas from you! Thanks for sharing! I am all about teaching the kiddos how to do little things themselves. My 5 and 6 year old are far more independent than my 14 year old...who I may or may not do everything for ;) Awesome give-a-way. I love the bin idea! And I'd love to win a silhouette! It doesn't say specifically what the giveaway is for but I still want to win because I know that it will still be awesome! Love the bins! My 3 year old loves to help, and this is a way that she can truly be helpful when it come to laundry! Would love, love,love this! Thanks for the chance! I totally agree with you. Play and laundry independence are more important than whether jeans are folded. Awesome! Love it! Thanks again! Cheers to teaching your little ones (especially BOYS) how to do their own laundry! Love those labels! I'd love a silhouette, especially if it meant clothes in the right bin! Yay, another giveaway! Thanks for the opportunity!! I love your blog! You have so many great ideas! My 4 year old wakes up every morning and has to look at your blog to see if there's a new project for us to do. I would love a Silouhette it would make crafting a lot easier. I just labeled my kids drawers with outlines and now my four year old son is super independent about getting dressed. It is wonderful. Daddy can also find stuff. Thanks for doing another giveaway :) Cute decals! It would be amazing if I won this! Thanks for the awesome giveaway! And I love the idea of labeling the clothes bins. Bins for clothes when you don't have a dresser, with four little people, and one dresser, I think I am in love with this! I keep entering giveaways, maybe one day I'll win. I'd especially love to win this time! Cute way to label clothes bins! Love the organization tips! The closets in our house were obviously built for 7 foot tall people so I can barely reach things let alone the kids! I'd love to win a Silhouette and here's another fabulous project I'd like to make with it!! I would love to win a silhouette, they look so cool, thanks for doing a giveaway! Love the clothes bins! My daughter "folds" the same way! I have been trying to convince my girls that they can put away the clean clothes I fold. Not going so well, but better than I expected. I love your blog! Thanks for the chance to win! Someday I'm going to get one of these- I have so many project I'd love to try with these! THanks for always dong the giveaways! Great way to teach more independence. and I would love to win! I would love one! My sister really enjoys hers! I also have 2 boys (twins) and now have a baby girl. It is VERY helpful when the older ones start doing things for themselves. Not only helpful for mom but I think important for their own self development. Thanks for the chance to win that awesome give-away!! Great idea! I would love to win the silhouette I have wanted one for a long time! Would love to win, thanks for the giveaway and the awesome idea that would work so well for my 5 year old! Please enter me....I'd love to win!!!! Way to help them learn to do more themselves!! Love your blog ! Great idea with the bins ! I also have my son's clothes separated into bins, but mine are fabric and have space for a label...which I have simply been too lazy to do anything about ;) I'd love to win the Silhouette, however, which could motivate me to make super cute labels (among other things)! The picture label on the bins are a great idea. I really should try that with my little guy! Thanks for the chance to win! I would LOVE a Silhouette! Thanks!! Would love to win this. Thank you for the chance. Thanks for another fabulous giveaway! Crossing my fingers that you pick me! I would lurve to win this thing! t'would be totally amazing to have it! I would a Silhouette a ton! I would love it!! I keep seeing all these ideas that would be wonderful but then I see that it requires a silhouette and as I am unemployed, I can't afford one! So hope springs eternal. Winning would be awesome! Love your blog! There are so many great projects I would just LOVE to have the sillhouette for. We use baskets for our boys' clothes too. Thanks for the chance to win! I'd love one! I'm a label junkie, and you can do so much more with your labels when you can cut vinyl! Love your blog, would love to win! Have a great day! What a great giveaway!!! I would love to win!! Oh my gosh! I would love to win. Have a Pinterest board full of ideas. Thanks! Awesome giveaway. Best wishes on little ones sorting laundry. The clothing labels are a fantastic idea! I will do this if I win the giveaway. I love that idea, the chance to win is just a bonus. Thank you for all the time you put in for us. I look forward to every post. I love how you got the pictures for your bins. I have bins as well, with words since my son is small, but want to change to pictures soon so he can "read," them as he gets older. Thanks for the giveaway! Would love to stretch my creativity with a Silhouette! Cool labels! Oh, I'd love to win. The no folding pants thing is something I can totally relate to. I have little boys who just hate doing that. Pick your battles! Great idea to organize clothes. I've been dreaming of owning a Silhouette! You make such fun things with yours! I'd love to win! If I had this machine I could copy all of your wonderful ideas. Love your blog. Thank you! Thanks for your post, the great reminder to let things like unfolded laundry go, and a chance to win the Silhouette. I'm grateful for your blog, Cheri! My e-mail is cmiller at fils dot org. I am all for simple. The bins are a great idea. Awesome giveaway! And such a great idea for the clothes bins! Great use of bins! I have wanted a Silhouette for a long time now, so thanks for the chance to win! What a great idea!! Thanks for the giveaway!! I love your comment about him being able to put away his own laundry. My 12 year old still fights us on putting clothes away. This is like my dream tool to own!!! I have been drooling over these for a long time and would love to win one! Thank you for the opportunity!! Even when you have a 16 year old, the clothes never stay folded. I love Silhouette and bins are an awesome idea. I'd love to win this! I also love the "bin" idea! Thanks so much! Love your blog! I've never used a Silhouette, but it sure looks like I could put it to good use--especially with all the fun ideas you share. Thanks for the chance to win! Love the bin idea, I think I am going to do the same for my boys. Great giveaway. Love the bin idea too. Wow. 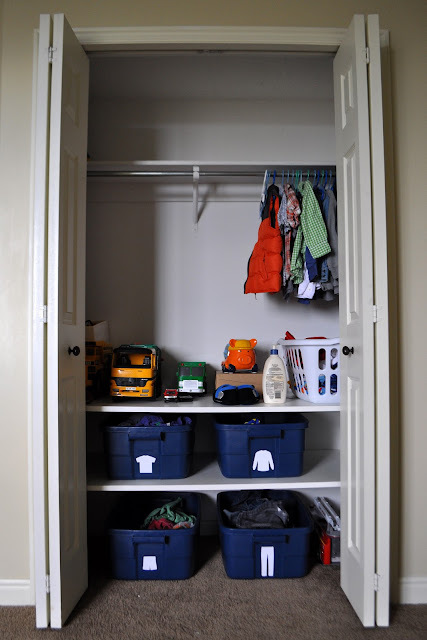 What a wonderful idea for organizing kids closets. Thanks for the giveaway! That's a great way to organize his closet. I was looking for how to do his shorts this year. We ran out of hangers for the # of clothes we have! Silhouette - yes please. My mom needs one for her craft room - badly! I love the bin idea, my daughter's room has a tiny closet and this would be a great way to utilize the space. Thanks for the chance to win! Would love to win this!! I would be a madwoman labelling everything. I know that you're going to have a million comments due to the giveaway, but I'll comment anyway. I have a Silhouette, and before my 2nd was born I was obsessive about labeling everything (dresser drawers, making bins for the top of their shared closet for clothes that are too small, etc). I created a manual for the grandmothers who were going to take turns watching my then 2 1/2 year old. It had things from simple recipes to places to go in the area to her friends names/contact info to our basic routine for the day. P.S. Since I already have a Silhouette, if I win, I'll offer it to a friend. Awesome! I am in to win cause I love this stuff! what a genius idea! I have 14 month old twin boys (I frequent your blog often!) so they're not quite ready to pick out and put away their own clothes, but dresser drawers can be tough to open and close and can pinch fingers. I'm definitely going to use this when they get older. Who needs to fold play clothes?! Thanks for the giveaway! I love this idea. And I love empowering little ones with a little bit of independence and responsibility. Thanks for the chance to win and for all the time and love you put into this blog. ohhhhh....I love this giveaway! eeeek. I would use a Silhouette so much!!! Yay, I would love to win this! Ooh, I want to win! I love the idea of the kids putting their own clothes away, too. My almost-4-year-old (girl) even LOVES to fold laundry (in her own style, but whatever!). This is perfect! I love this idea for marking bins so the three year can put away her own laundry and I'd LOVE a silhouette. <3 your blog, as always! I would really love one of these machines hope i win. i would love to make things for my kiddos and home with this bad boy! Love the simple entry! Thanks for the chance to win! i need to make those bins for my son. great idea! Hooray for kids being able to do more for themselves! I love that idea - might have to co-opt it for my 4 year old. Love your blog - thanks for the chance to win. Thanks for another chance. Fingers crossed! Cool organization! Would love to win! I recently so a post about fileing the folded clothes instead of stacking them in the drawers. The poster - I can't remember who or where this came from - said it cut down on the amount of laundry because clean clothes didn't get mixed in the dirty clothes and her children were ble to dress themselves easier. I thought it was a great idea. Maybe her idea and yours could be incorporated together. I love that you don't care that the clothes aren't folded. They are never folded in my kids drawers either, but at least they are put away! I would love to win! I'd love to have a Silhouette!! I Love reading your blog and I would love to have a Silhouette for all the projects that I want to tackle! Thanks for the chance to win! Here's hoping! It's so fun to help them be independent! Thanks for the giveaway and the ONE comment entry. Cute closet idea. I would love to have a silhouette to get some things organized around my house! Thanks for the great idea for the vinyl! I would love to win the giveaway! Love your closet plan...perfect for boys! So many projects I want to do with one of these! Thanks for an awesome giveaway! It would be nice to win one. I make my three year old fold her clothes. It takes a lot of encouragement, and sitting next to her. She eventually does get it done. Would love to use this for some projects! It would be so wonderful to win a silhouette. I'm crossing my fingers. Ohhhh, fun! I hope I win! I have been dreaming of owning one of these . . . I love to see all the neat projects made with the Silhouette! There are so many fun things to make and labels for the storage bins are great. Thanks for sharing this with us! I would love to win! So many projects to be made! Awesome idea. I would so love to win. Gotta keep trying to win one of these babies! :) Thanks for the opportunity! Love it! That is how both of my kids have their clothes organized. I just printed pictures off the Internet. Would love to win this for my scrap poking and crafting mom. It would make an awesome Mother's Day present! I love how you made it easy for your son to take care of his stuff. I wish my boys had the shelves in their closet for their semi trucks. Thanks for having such a great giveaway! Super cute idea!! And, thanks for the chance at a Silhouette Portrait! Oh wow I would love to win! Thanks for the chance! What a fun giveaway. Thanks for all the fun ideas. I love hearing people's secrets like that they don't fold all their laundry. I never iron. My email is stace.burton@gmail.com. Hello, great organization project. Thanks for a great giveaway! I love the independence of being able to reach his own clothes and put them away himself. I am trying to teach my three year old son how to put his clothes away in his dresser. I love the idea of putting the clothing item on the front. Your blog is so amazing. Love Mommy School by the way!!!!! The bins are a great idea--we're moving--will put it to use! Do you find he always chooses the one on top to wear? I'd love to have on of these.